Eggnog to celebrate our backyard eggs! One of my first memories of the holidays was navigating my grandparent’s home with my eyes fixed on a cup of egg nog clutched in my hands to bring to my parents. When I realized our girls would start laying around the holiday, making eggnog seemed a fine tribute to their efforts, especially after hearing a story about Salmonella being unable to survive in homemade spiked eggnog. Our girls started laying on December 26th, supported with lights, our best wishes, and laying mash (which has nutrients for strong shells). We augmented our collection with eggs from Dragonwood Farm and plunged into making the recipe of family lore. Handed down on index cards to email, from my grandmother to my father to me. This remarkably simple recipe resulted in a great amount of nog. After folding in the egg whites and the whipped cream, the color was a soft inviting light yellow (thanks to the bright orange of the yolks, rum, and brandy). The texture felt to me like the almost melted bits at the end of a milk shake. The taste was wonderful, light, not overly alcoholic, a nice balance between kick and cream. I added cinnamon along with nutmeg and the aroma of the rum, brandy, and spices brought me back immediately to those holiday parties 20 years ago. I like the idea of the term egg nog being a contraction of Egg ‘N Grog from the English term for Rum. 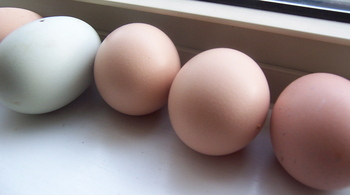 I also like the idea of expanding my repertory of egg recipes as the girls hit their stride. I feel I need to be worthy of their beautiful eggs.